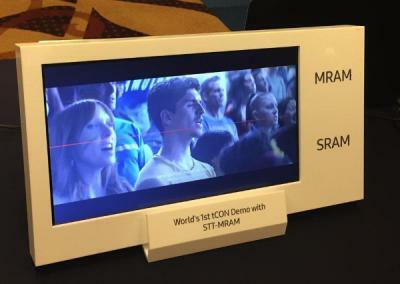 Samsung demonstrated an LCD display that uses a tCON chip that uses embedded 28nm pMTJ STT-MRAM memory, instead of the normally used SRAM. The MRAM device had a density of 8Mb and a 1T-1MTJ cell architecture. The cell size is 0.0364 um2. A tCON chip is a timing controller chip that processes the video signal input and processes it to generate control signal to the source & gate driver of the LCD display. The memory is used a a frame memory which stores previous frame data. Samsung prepared a test chip that contains both SRAM and MRAM memory devices to show that there is no difference between the two. SRAM replacement is a popular MRAM application. In July 2016 IBM and Samsung co-developed 11 nm pMTJ cells. This breakthrough caused IBM to announce that the ""time for Spin Torque MRAM is now".